Many students travel to Mexico, Florida, or someplace warm for spring break. Not many take a trip overseas. 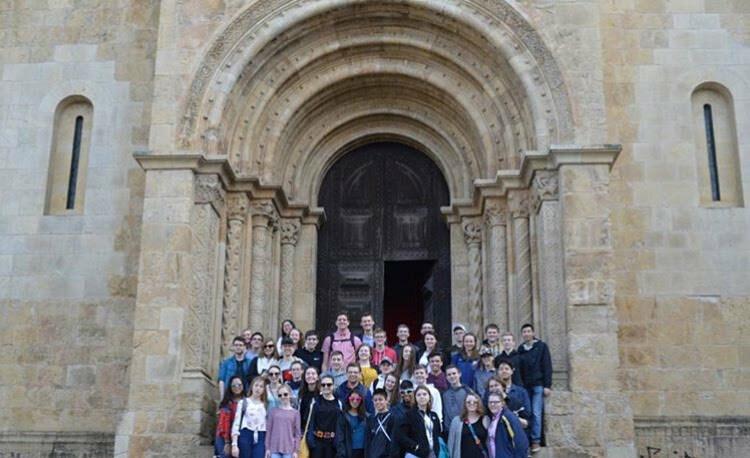 This year the Totino-Grace Music department took a seven day trip to Portugal to perform in many different cities. The students arrived on Sunday, March 11th to be greeted by sunshine. One group arrived really early so they got an exclusive tour of the city of Lisbon or Lisboa. Once the second group arrived they boarded the buses and went to the city of Fatima and visited the Fatima shrine. Here the students attended a Portuguese mass and the choir sang a small hymn following the mass. After mass the students got back on the bus and went to Figueira De Foz were they would stay the next two days. On Monday the students took a trip to a small city called Coimbra where they were given a tour of the university. After the university tour, the students had leisure time and was able to walk around, try some food, and shop. This was a very popular location for many students on the trip. After Coimbra they headed back to Figueira were they had more leisure time. It was the only time on the trip that the students were able to go to the ocean. Many students stayed in the hotel while others explored the city looking for places to shop and admiring all the graffiti. Tuesday morning the students went to Guimaraes were they visited a castle and had more leisure time for lunch. They then had their first performance in part of the castle. After their performance, they took a long bus ride to Porto. Here they checked into their second hotel and enjoyed a nice hot buffet dinner. Wednesday was an extremely wet day. Students from the La Salle school gave them a bus tour of Braga because it was too dangerous to get off the bus due to the wind. They stopped off at the top of a mountain to visit a church. The front of the church overlooked the city and the stairs looked as though they led into heaven. After the church the students were brought to La Salle school were they ate lunch and hung out with some students. Then they performed for the school. A quick ride to Barcelos where they choir sang in a church with a small children’s choir from Portugal. After arriving back at their hotel in Porto, the jazz band performed at a local club. Thursday consisted mostly of travel. The morning kicked off with a performance at the Oporto British School. When groups were done performing some students went and played with the students of the British school. After the performance, a stop was made at a local mall for lunch before a long four-hour bus ride back to Lisboa. Once they arrived in Lisboa they checked into their hotel. The last day in Portugal was Friday. On the way to their last performance at St. Peter’s International School they were given a bus tour of the city of Lisbon. They stopped and saw the Belém Tower and did some shopping in a local marketplace. Portugal is known for their cork industry so many of their purses, clothes, and other items were made from cork. After arriving at St. Peter’s International School, they were given a tour by some of their students. The TG performed for them followed by lunch. After Lunch St. Peter’s School put on a small performance and it was outstanding. Anytime you are hesitant about going on a trip with some friends, school, or by yourself, go on it. Have no regrets. It is better to try something than regret never doing it.